If you've picked up the PS3 version of Dragon Age: Origins Ultimate Edition, and you're in Europe, you're not getting everything that you paid for. 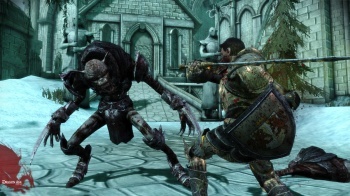 European PS3 Owners who have grabbed the Ultimate Edition of Dragon Age: Origins over the last few days have found that the game contained much less Ostagar than it should should, after an error resulted in BioWare leaving the Return to Ostagar DLC off the disk. Writing on the BioWare forums, Dragon Age producer Fernando Melo apologized for the error and said that while the Return to Ostagar pack was listed on the disk, the content was actually for something else. He said that anyone who had been affected by it should contact EA to get the Return to Ostagar pack added to his or her EA account, and then download the missing content via the PSN store. Melo made it clear that the error only applied to European copies of the game, identified by a product code on the starting with "BLES," then followed by a number printed on the spine of the game box, and said that the North American version worked fine. While this is obviously an embarrassing error for BioWare and EA, at least it's something that was could be fixed relatively easily. Of course, anyone whose PS3 isn't hooked up to the internet is going to have a tricky time getting the content he or she is missing, especially if the reason behind the purchase of the Ultimate Edition was to get the DLC he or she couldn't obtain any other way.